Chef Yukio Takeda at Kaetsu at the Grand Hyatt Hong Kong creates some deliciously divine dishes -- if you have enough room in your stomach for them. He's a personable chef, quiet but keen to please his customers with dishes that are not only freshly prepared but also feature top quality fresh ingredients. I recently had a tasting of 10 dishes including dessert, each small dishes, but accumulated into quite the feast. We tried pacing ourselves but to no avail. The beginning of the meal had a strong punch -- we were treated to small cups of warm and pungent sake with a small puffer fin in it that we ate. Yes, it's the same fish as the ones the Japanese prize for its meat that can be deadly if sliced the wrong way. But we were pretty safe with the fin that was a bit chewy, and also marinated in the sake. Then came the pike eel and green pea dumpling clear soup. The one large dumpling was a sculpted lime-green dollop that tasted light but was quite filling. The clear broth was very flavourful and good to the last drop. Every dish came beautifully presented, particularly the selection of sashimi each diner's portion presented in different bowls, with leaves and shells incorporated into the dish as decoration. 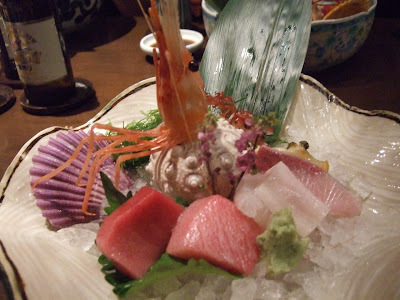 We had generous slices of prime tuna, yellowtail, halibut, whelk and sweet shrimp garnished with fresh seaweed. All were very fresh and delicious, but the standout was the prime tuna that was succulent, meaty and smooth at the same time. 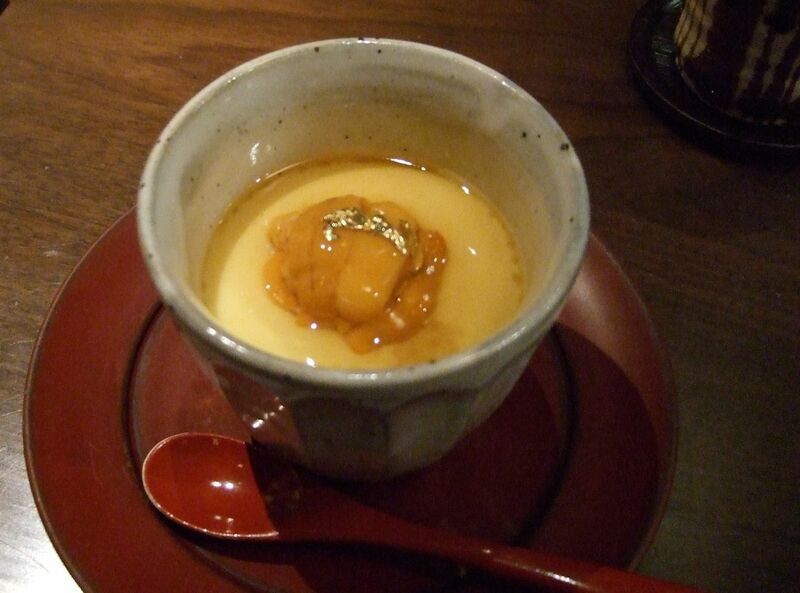 Next came a cup filled with steamed egg custard topped with sea urchin and gold foil. This was probably the highlight of the meal for me, as the smooth steamed egg complemented the texture of the sea urchin, while the latter added lots of flavour to the former. Needless to say each bite was slowly savoured. We were already quite full by this point, but only halfway through the meal. Another beautifully presented dish was the grilled marinated flounder fish in miso paste. The fish was cooked perfectly with a crunchy crust, accompanied by a stick of fresh radish. We were also impressed by the shrimp, conger eel, crab, sweet corn, sweet potato and Japanese pepper tempura. The batter was lightly deep-fried and didn't didn't require the usual dipping sauce with minced radish. As if we weren't full yet, the grilled Japanese wagyu beef with miso paste was another winner. 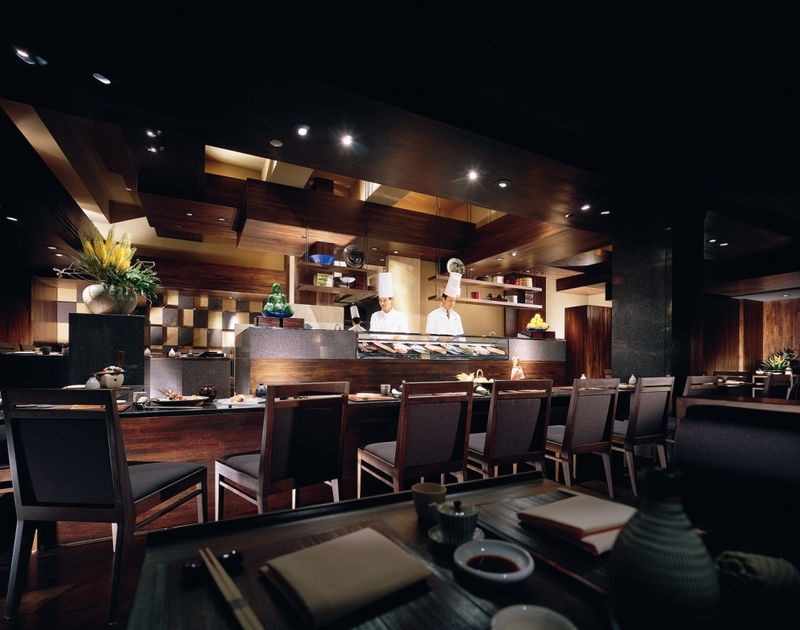 Each portion was placed on top of a large brown oval leaf which in turn was on top of a mini Japanese tabletop charcoal grill that emitted no smoke. 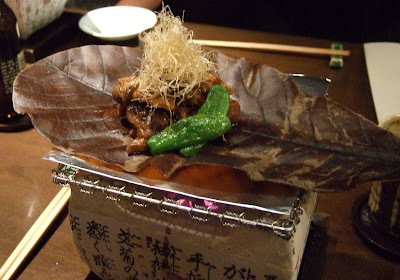 Each piece of wagyu practically melted in the mouth and was accompanied by big chunks of mushrooms. 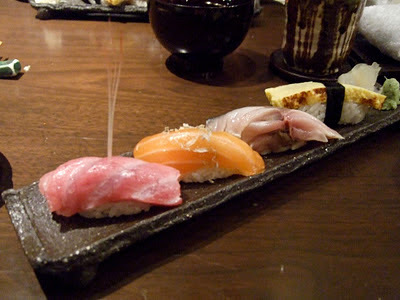 Next came a selection of sushi -- prime tuna again, marinated salmon, scallop, mackerel and egg. On top of the tuna was a piece of fish bone that Takeda explained could also be used as a toothpick and it did come in handy. At this point I could barely finish them all and felt there was hardly any room left in my stomach. However we managed to wash things down with the sweet-tasting clam miso soup, full of hearty clams in the shell. It was a perfect comforting soup for either the beginning or end of the meal. 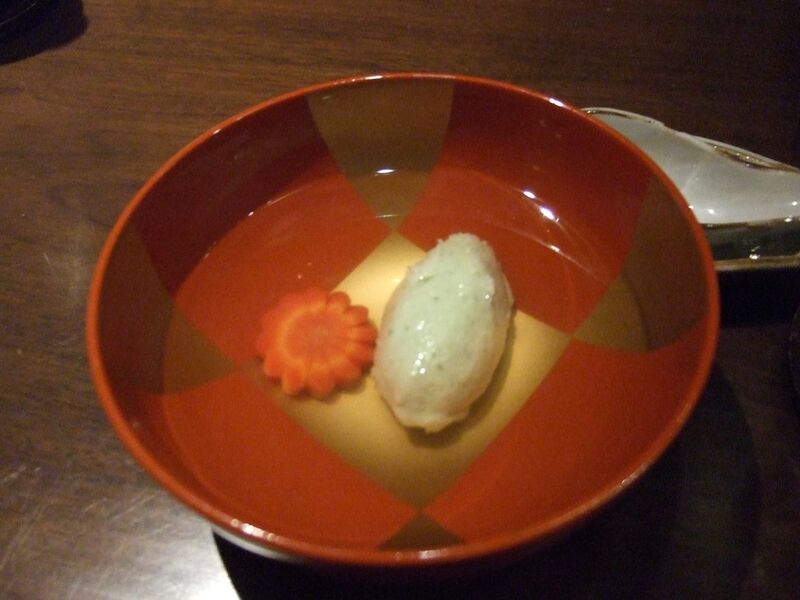 As if that wasn't enough, dessert was an intriguing combination of cut fruits with wine jelly. It would have been better as a summer dessert, but refreshing nonetheless.